Is he a Man from Shang or a Man from Shu? Or is he a figment of modern fakers skilful invention ? This little fella is perforated from the top of his rather flat head so he is really a bead. He must be Beadman, oops, what am I talking about, of course I mean Jademan ! There are three things that puzzle me about this piece. I find his rather flat and bare head rather strange. 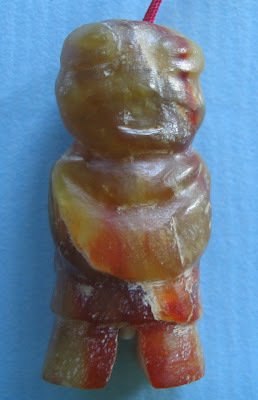 Most Chinese archaic jade figurines will have some sort of hat, headwear, braids or something. I think the Chinese consider the head/brains very important. However I have come across a few figurines in books with flat heads so my piece may belong to the minority. has his right hand resting on his left arm for the front view, while at the back the left hand rests below the waist. He looks like he is in a pose of admiring the moon or composing a poem ? Figments of my own imagination :)) ? 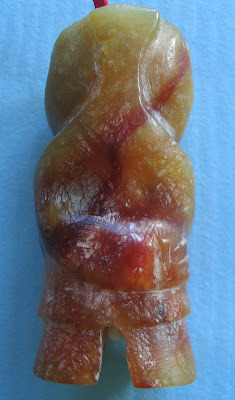 The last puzzle is the back (see pic below) where the head is cut away and looks like the neck of a vase. Indeed the body does look not unlike the rounded part of a vase. However the fingers are carved in detail. 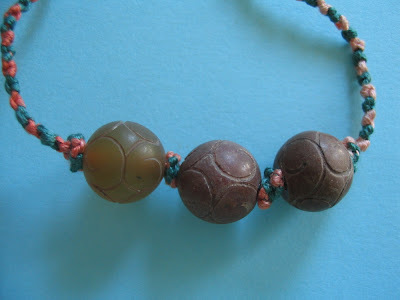 I have strung my Jademan with a string of very old carnelian beads. As I cant accurately pinpoint his years, I shall just say he is Mystery Guy from the Past and treat him like "..my little good luck charm...uh-huh huh, you sweet delight....." :)) He is all of 4.2cm tall. 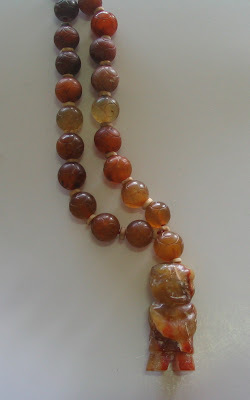 The rounded carnelian beads have a "C" scroll pattern and maybe five hundred to a thousand years old.